Bangkok's holiday festivities will hit new heights with Beautiful Bangkok, a 60-storey light-and-sound spectacular from seven top Thai artists under the theme The Symphony of Happiness. 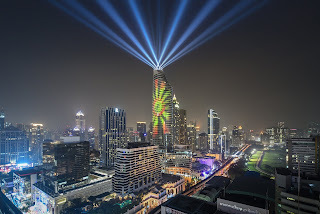 The Thai capital will be set alight by Magnolia Quality Development Corporation Limited (MQDC), the company behind the high-tech 3D projection mapping and laser show, which will run from December 18 to New Year's Eve, drawing Thais and tourists to Ratchaprasong, a district famous for festive displays and 'countdown' parties. MQDC CEO Mr Visit Malaisirirat said: "Beautiful Bangkok celebrates New Year by commissioning the greatest artists to capture the city's true beauty - the happiness of its people - and confirms Bangkok as Asia's 'countdown city'. "We worked on The Symphony of Happiness with seven of Thailand's most famous contemporary artists, offering them the vast canvas of Magnolias Ratchadamri Boulevard (MRB), a 60-storey residence and the home of Waldorf Astoria Bangkok. "MRB's striking façade, inspired by magnolia flowers, provides the perfect setting for this huge event." The seven artists (and you have to love some of the names) are P7, Mue Bon, Pai Lactobacillus, Tikkywow, Keep Your Eyes On team, TRK, and Bonus TMC, all from Thailand's thriving street art scene. MQDC will continue to host Beautiful Bangkok each year, said Mr Visit (what a great name for someone involved in the tourism industry). "MQDC will do this every year as our special gift to Thailand. We seek to capture and celebrate the beauty of Thai happiness. The annual shows will spotlight Bangkok as a great place to greet the New Year, a countdown city on a par with Hong Kong, Singapore and Sydney. "The show will once again draw a vast audience, amazing and delighting Thais and tourists alike." There will be seven performances a night. See www.magnolias-ratchadamri.com/happenings.